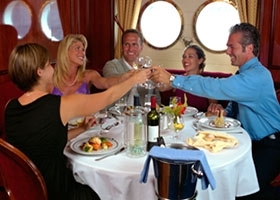 Featuring a $25 per cabin Onboard Credit! Featuring our latest innovations, Crown Princess is one of the largest Princess ships, with room for 3,080 guests. From her nearly 900 balconies, you can enjoy sweeping views of romantic landscapes across the world. After experiencing the relaxed comfort of our intimate onboard venues, however, you may not want to explore the beauty ashore! The serenity of The Sanctuary® and the casual street café atmosphere of the Piazza may just reel you in for the day, while your nights might be filled with the great tasting food offered in the Crown GrillSM followed by a first-run film at Movies Under the Stars®.